Today, any gesture of opposition to the American-backed regime is reported to the security agency. As many as 9,000 people, mostly suspected Hamas sympathizers, have been arrested by these agencies in the West Bank since 2007. Many or most of the detainees are subjected to physical and psychological torture. Indeed, at least ten detainees died under brutal torture in police facilities maintained thanks to American and European tax-payers' money. Anyone listening to Palestinian Authority (PA) Chairman Mahmoud Abbas these days would think the man is a paragon of democracy and liberty. Abbas, who has remained at the helm of the PA despite the expiration of his term in office, has been exhorting Palestinians to prepare for "presidential and legislative elections" which he called a "constitutional imperative." However, a deeper look into Abbas's behaviors at home shows that the PA Chairman is not really interested in holding true, free and honest elections. After all, actions speak louder than words. Today, Abbas is presiding over a ruthless despotic regime where the level of repression is unprecedented since the start of the Israeli Occupation in 1967. There is a nearly total absence of human rights and civil liberties. As to the rule of law, it is virtually paralyzed. Some human rights groups which wronged citizens used to turn to for help have closed their doors, apparently under pressure from the PA security agencies. A few weeks ago, I met a young Palestinian teacher who was fired from his job by the security apparatus for reasons he is yet to know or understand. "I don't know why they did it. I am a good teacher and had been lawfully appointed as a teacher. Suddenly, I was notified by the headmaster that I was fired for undisclosed reasons." The teacher, a father of three children, said he suspected that the main reason for his dismissal had to do with his relatives who happened to be outspoken critics of the PA regime. In addition to the dismissal, the PA is refusing to pay him thousands of dollars of unpaid salaries which he says could help him reorganize his life. The teacher appealed to European Union (EU) and other donors to see to it that the PA treats its citizens with a semblance of justice, dignity and decency. "Don't enable the PA to deny its own citizens their basic human rights. Don't enable the PA to oppress, savage and humiliate us." The teacher who hails from the Hebron region says he was already contemplating emigrating to Scandinavia to escape "the Fatah tyranny." "I am not a member of Hamas, I have never been a member of Hamas. I am not even a particularly religious person. Yet, I was hounded and eventually fired from my job on no ground other than the fact that some of my relatives are religious people. "I have been a teacher for three years, and now they've decided to jettison me like an old pair of shoes. They wouldn't even pay me my dues which could help me re-organize my life. So what am I supposed to do? Become a collaborator with the Shin Beth? Or go to Jewish settlements to find work to support my family? Or emigrate to Australia or Canada or any other country." In truth, that teacher, who was reluctant to give his identity for fear of further retaliation, epitomizes hundreds of civil servants who have been unceremoniously fired from their jobs on suspicion of sympathizing with Hamas. However, their efforts to find justice have been to no avail as the PA establishment has enacted "emergency laws" stating that the security agencies had the right to fire any public employee without having to justify the decision. In other words, one has to worship the government if one is interested in keeping his or her job. There is a name for such a government. It is called a fascist government, straight and simple. The absence of justice in the West Bank goes hand in hand with the absence of civil liberties including freedom of expression. This writer personally knows many young people who have been arrested and maltreated for hoisting the green Islamic banner bearing the Islamic article of faith. 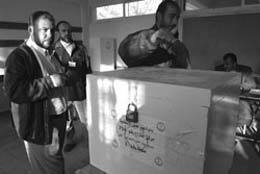 Others were subjected to harsh interrogation over which political party they had voted for in the January-2006 elections. At colleges throughout the West Bank, half of the students have been made to inform on the other half of the student population. This is really poisoning the college atmosphere and creating deep mistrust among students. Similarly, newly-recruited PA informers all over the West Bank have replaced, or more correctly, augmented Shin Beth collaborators, in carrying out the "job" of informing on any opposition to the Ramallah regime and the Israel occupation. Some of the informers even inform on people frequenting mosques especially those attending the dawn prayers. In short, there is a real virulent police-state atmosphere prevailing throughout the West Bank where the security agencies are playing a dominant role. Hence, one really wonders if free and honest elections can be held under these conditions. We have to be honest about this issue because free elections require true freedom which would enable citizens to choose candidates without the fear of getting arrested, or subjected to reprisals by the government and its security arms. More to the point, how can true elections be held when one party, e.g. Fatah, is allowed to campaign freely while another party, e.g. Hamas, is denied that right? Can Hamas, for example, organize a single rally in the West Bank today? Are there guarantees that the PA security agencies wouldn't riddle with bullets Hamas supporters and then claim that the Islamists "were trying to carry out a coup against Palestinian legitimacy."? One more point, let us suppose that Hamas would win the elections, that is if and when truly free elections were held. Would Fatah then accept the results? Would the so-called International Quartet (UN, US, EU and Russia) accept the outcome? Would Gen. Keith Dayton, the de facto ruler of the West Bank, and his bosses and subordinates accept the outcome? Would Hamas be recognized as the legitimate leadership of the Palestinian people? More importantly, would Israel allow Hamas to take part in the elections? And would the Israeli Occupation army refrain from arresting Hamas's candidates on the ground that Israel, not the PA, had the final say with regard to the elections? These are legitimate questions that must be answered before the organization of elections. If the Palestinian masses don't get satisfactory answers to these legitimate and most logical questions, then the Palestinian people will just repeat the same bitter experience which started immediately after the 2006-elections when millions of Palestinians were severely punished for electing Hamas. In truth, it seems that nothing really has changed ever since, as the Quartet continues to insist that Hamas recognize the"legitimacy" of Israel, even without a reciprocal Israeli recognition of a Palestinian state. Indeed, the persistence of the blockade of the Gaza Strip, along with Israel's refusal to allow building material to get through to Gaza, is a clarion proof that the elections designated for 24 January are not being pursued in order to allow the Palestinian people to choose a new leadership but rather in order to get rid of Hamas by concocting and falsifying elections. Hamas must never allow this to happen.